The long-anticipated Cherry Blossom Festival in Marshfield, Missouri delivered everything that was promised and more. For Gone With The Wind fans it was a haven of memories as they were treated to an art show by artist Joseph Yakovetic featuring many GWTW pictures and others by the famous artist who has Disney pictures and Wizard of Oz in his collection. Two actors who played Beau Wilkes at different ages– Mickey Kuhn the older Beau, and Greg Giese, the infant Beau– were on hand and guest got to talk to them and get their autographs. 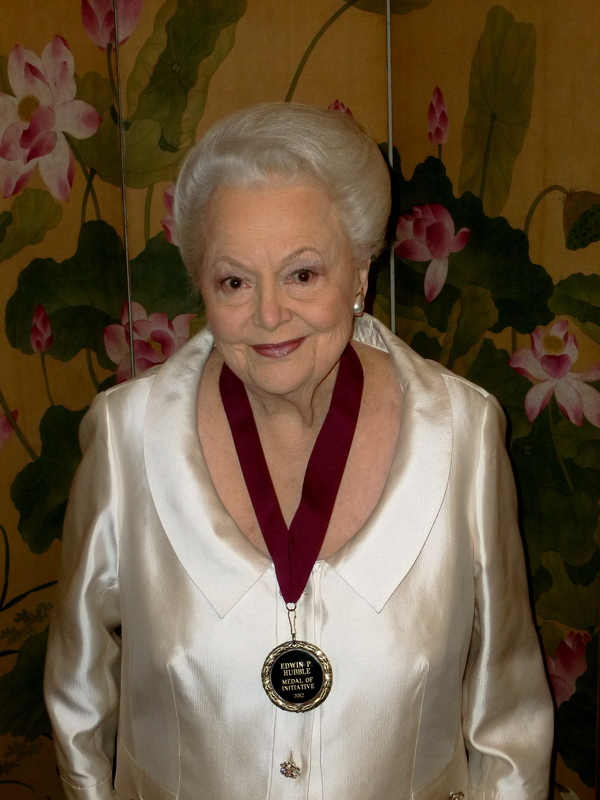 The special dinner where the GWTW surviving cast was to receive their Hubble Medals was opened up with a Power Point presentation featuring a touching acceptance speech and greeting from Olivia de Havilland. De Havilland prepared the audio speech from her home in Paris just for the event and mentioned the name of the church and several people in attendance. This writer was proud to be able to introduce and give a short speech about Greg Giese and also Joseph Yakovetic, both of whom were honored that evening. GWTW collector Dr. Christopher Sullivan introduced and spoke about Mickey Kuhn. 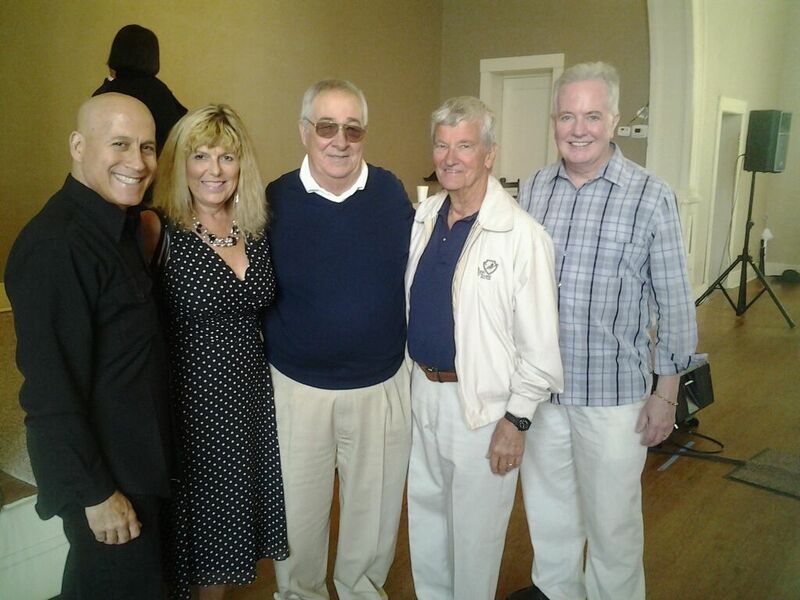 Artist Joseph Yakovetic, Sally Rains, the two “Beaus” Greg Giese and Mickey Kuhn, and GWTW collector Dr. Christopher Sullivan at the 2012 Cherry Blossom Festival in Marshfield, Missouri. On Sunday Alicia Rhett sent a picture of herself holding her Hubble Medal at her home in South Carolina which capped off the weekend. The Reverend Nicholas Inman, the founder and executive director of the Cherry Blossom Festival which has been going on more than 10 years worked diligently to secure the photos of Olivia de Havilland and Alicia Rhett. 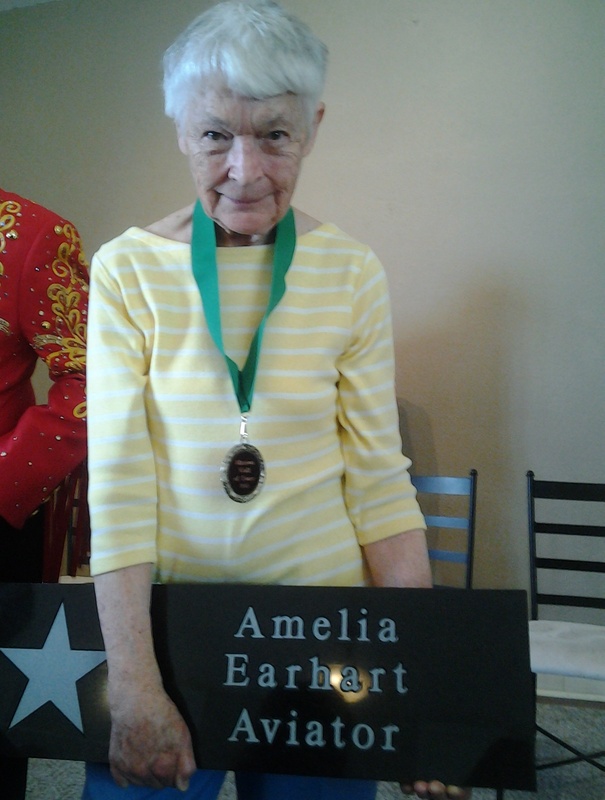 Amy Morrissey Kleppner, the niece of Amelia Earhart accepted her “Star on the Walk of Fame” on behalf of Earhart. This writer assisted Inman in the Rhett and de Havilland efforts and was please to receive several letters from Miss deHavilland with her appreciation for the efforts made on her behalf with the winning the award. Inman also had an additional impressive cast of characters and award winners appearing at the festival including Jean McFadden, the Director of the Macy’s Day Thanksgiving Parade (for 25 years), Dawn Wells who played Mary Ann on Gilligan’s Island, and Amelia Earhart’s niece along with the largest annual assembly of presidential and Founding Fathers descendants in the country. Ginger or Mary Ann? This is Dawn Wells, who played Mary Ann on the classic television show Gilligan’s Island holding her star for the Walk of Fame in Marshfield, Missouri at the Cherry Blossom Festival. 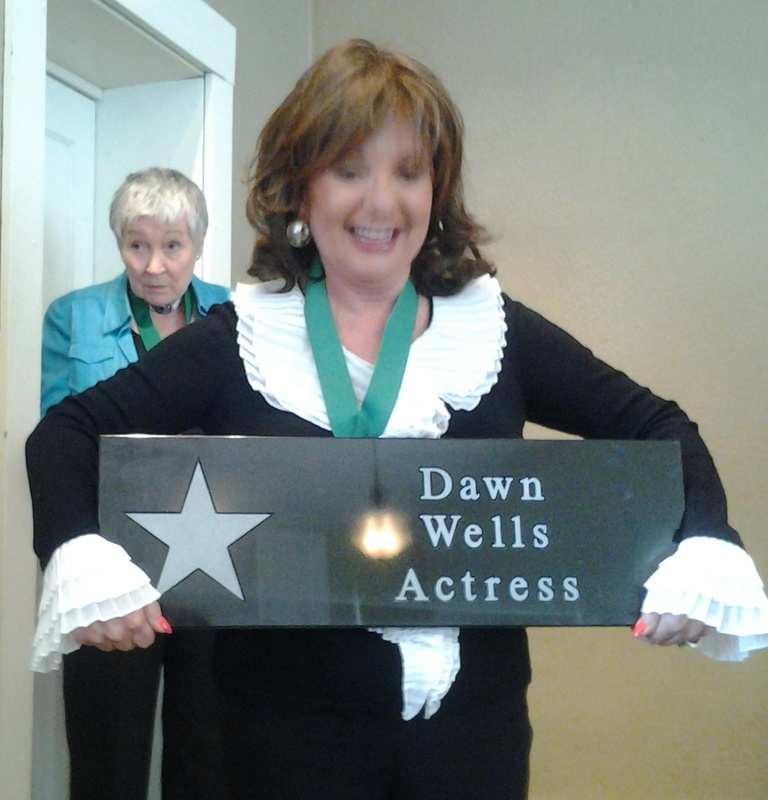 Dawn Wells seemed excited to receive the award asking fans who took her picture on their cell-phone to email some to her. She also enjoyed appearing with the Presley Family who came in their red performing jackets that they wear in their long-running Branson show. Former first daughter Jenna Bush gave a talk at the festival and there was even a Brigadeer General, Lucian Truscott IV. Television actress Morgan Brittany was also an award participant and mingled with the crowd. Brittany is famous for her role as Pamela Ewing’s half-sister Katherine Wentworth on Dallas but she has also starred in many other television shows and movies, including “LBJ, the Early Years” with Randy Quaid. 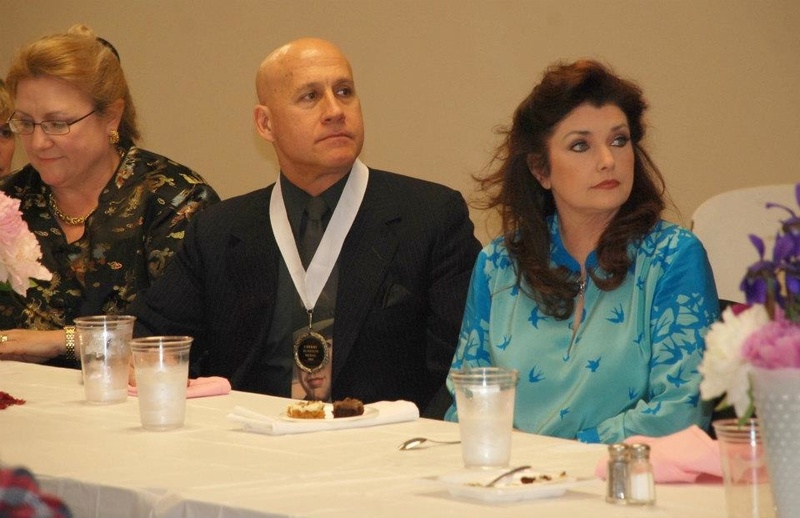 Marie Clinton Bruno (first cousin to former President Bill Clinton), Joe Yakovetic, and Morgan Brittany. Lynne Jackson, the executive director of the Dred and Harriet Scott Foundation, and great-granddaughter of Dred Scott– famous for the Dred Scott Decision which came down on the St. Louis Old Courthouse steps– put together an excellent panel. Can you imagine the great-grandson of Confederate president Jefferson Davis sitting next to the great granddaughter of Dred Scott? The program was entertaining and interesting. 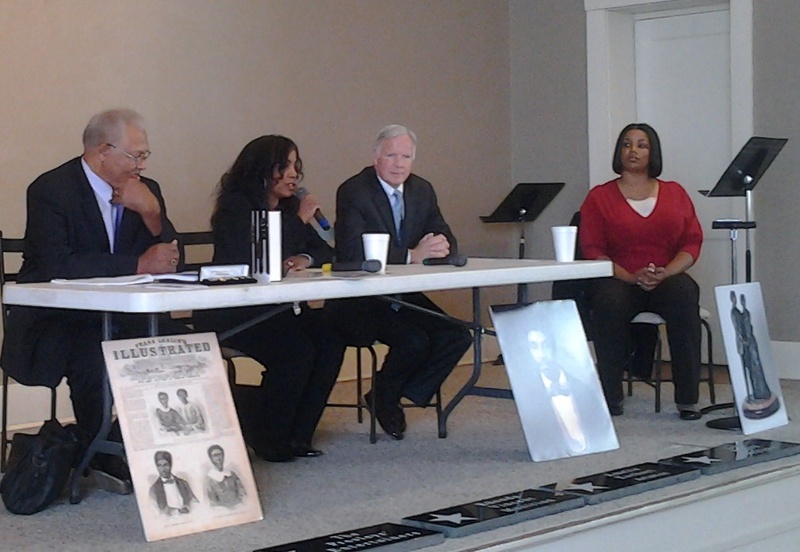 Dred Scott Reconciliation Forum featuring in the center, descendants of Dred Scott and Jefferson Davis. More good news for Dred Scott Foundation and you are invited! You are cordially invited to attend the dedication of a statue honoring Dred & Harriet Scott scheduled for Friday, June 8, 2012 at 3:00pm outside the Old Courthouse, Dred Scott Way (4th Street), St. Louis, Missouri. Each year we like to promote the Cherry Blossom Festival and it gets better with each event. For those who have not attended but think the guest list is amazing, make plans to attend next year’s festival. Nicholas Inman and his crew are already working on it and they aim to make it even better than this year. This year’s is a hard act to follow and will be hard to top. 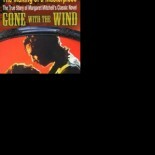 Sally Tippett Rains is the author of The Making of A Masterpiece, the True Story of Margaret Mitchell’s Classic Novel Gone With The Wind (www.GWTWbook.com) and is the content manager/ producer of StLSportsPage.com and The Sports Zone Radio Show with Rob Rains and B.J. Rains. This entry was posted on May 4, 2012 by gwtwbook in Gone With the Wind, Uncategorized.